The Life of Bon: Are you done with your Christmas shopping yet... ? Are you done with your Christmas shopping yet... ? [ ] HAVEN'T EVEN STARTED MY CHRISTMAS SHOPPING SOMEONE HELP MY STRUGGLED SOUL! If you checked box number one, then congratulations you have figured out the secret to life at Christmas and we all could learn from your greatness and wisdom. If you checked box 2 or 3 then have no fear I am here to help! As a little girl my grandma used to always give us boxed makeup and perfume sets for Christmas and I LOVED it. I think I loved it so much because my mom wouldn't let me wear makeup yet so when I saw the makeup and perfume I felt like my grandma really got me. She understood my excitement to wear perfume, to shave my legs, to be grown up now! 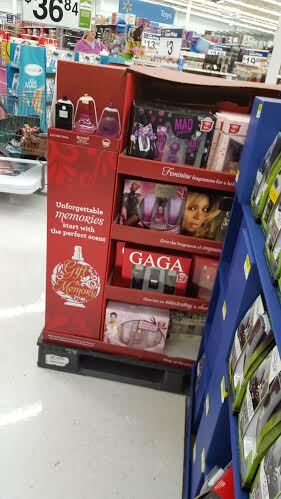 My grandma passed away 8 years ago, but whenever I see these perfume gift sets at Christmas time now I think of her. I swear I can still smell the perfume now. This year I am excited to be gifting a COTY Katy Perry Mad Potion gift set to two of my cousins. I mentioned on this blog a couple of months ago that my cousin lost her husband, leaving behind seven small children. I've gotten to spend a little bit of extra time with these kids and I wanted to give a little gift to the two oldest girls who are so strong and going through so much right now. There's a special place in my heart for girls who have lost their daddies too soon and even though it's a pretty simple gesture, I'm excited to be able to give this Katy Perry MAD potion to them this Christmas. And if I know pre teen girls like I think I do, nothing is better in their world than a Katy Perry perfume set. The best thing about these gift sets is that they make giving a breeze. Every Christmas I feel slightly more frantic than the one before and I wonder how I will get everything done before Christmas. COTY perfume gifts sets make giving quick and simple during the hustle and bustle of the season- I mean, it's practically even wrapped for you! Find ways to give this holiday season here. Thank you so much to all you readers for supporting the brands that support my blog. I enjoy doing all my sponsored posts, but this one was especially fun because CHRISTMAS and because I get to give this gift set away and I know those little girls are going to love it. It's because of my readers that I get these cool opportunities so THANK YOU.